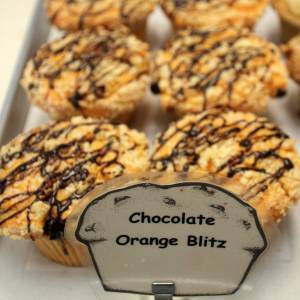 Chocolate thunder and orange lightening combine to create this blitz-ful muffin. Your taste buds will quake before its muffin might. The thunder-god himself (whose personal baker Frank got the recipe from) eats three hundred of these cakes a day to give himself power! Eat this muffin and shout wild battle-cries to frighten off trolls, ogres, and mortgages as you speed along in your car/battle chariot. Share it with friends and family to bring vitality and wealth to your relatives. And above all: Eat, drink, and be merry!